tl;dr this book was ok, revolving around Alexia's last month of pregnancy. There were some funny moments due to her overlarge state, but otherwise it was only ok. Not one of my favorites in the series, but still quite entertaining and enjoyable! Description: Alexia is 8 months pregnant, and quite content with her life now that Conall has come to accept that the child is, after all, his. Everything is quiet - or, quiet-ish with a pregnant alpha female living in a house with a pack of wolves. Until one day, when a ghost appears and warns of a death threat to the queen. Alexia eagerly takes up the investigation, while trying to put together a house in London next to Lord Akeldama, and of course - getting ready to give birth. Lets see. This one is ok. Yet again focused on her final bit of pregnancy. I must say, there were some rather hilarious moments of her waddling around pregnant and still trying to act as she always has. Investigating and getting into sticky situations that are rather dangerous. Good on you, Alexia! Never give up your ways! The overall story of this one was... interesting. A ghost showing up and warning of a plot against the queen, but with nothing else to go on Alexia starts where she thinks she should: the original threat against the Queen of England when the Kingair pack was going to poison the queen. 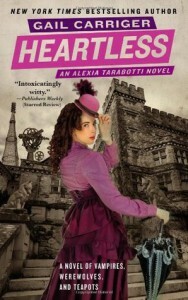 Alexia continues to dig into that past, where she finally learns who was the instigator of that plot. This was a pretty good twist to me, as I didn't see it coming. I thought it would be someone else, so I was quite intrigued with how it went. So yes, lets see. More Felicity in this book and GOODNESS i am just SO over her showing up all the time. She's obnoxious, and their banter no longer interests me. She's just a toxic awful character and I can't stand her. Love Lord Akeldama forever and always. He is perfect in this book, as he is in the rest of the series. I quite adore him! Ah! Seriously, I want him to be my best friend. He's wonderful. I thought it quite intriguing that they decided to let him adopt their child to appease the vampires, and actually kind of liked that idea. I wasn't so sure of the Genevive line, however. She was one of my favorite characters, but I just kind of hate that she got so drastic.... even if the Westminster hive is an obnoxious lot. That was the thing I liked the least in this story, but it wasn't awful. And overall, I liked this book more than the second, though its not my favorite.